​ It is ten years after the great upheaval, the Apocalypse, has ended. Despite living in a dark and gritty world, the Steampunk culture has rebuilt the nation, trying to make it beautiful again. One can now find large metropolises, economic stability, huge technological advancements, a return to fashion, and much more. Unfortunately, this grand new world comes with a terrible price. A battle is being waged between these enhanced humans and the citizenry of old. The same terrorists who created the Apocalypse ten years prior, want to rid the world of the newly-dominant Steampunk society. Will they hold onto their outdated ideals and be left in the dust of history? Or will they adapt and change, insuring their survival in this new Steampunk civilization? 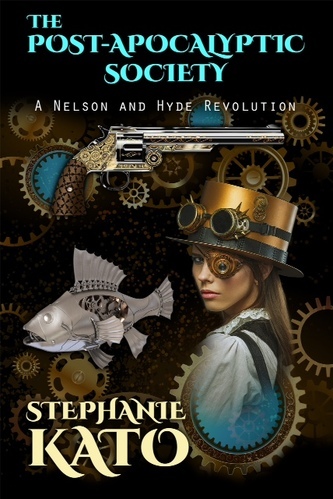 Embark on a nautical Steampunk adventure! Excitement and danger lurk above and below the surface of the seas, when the Nelsons meet a new enemy. The Steampunks are holding a mysterious treasure aboard a retro-futuristic ocean liner and a band of greedy pirates want the spoils. This is a tale of oceanic swashbuckling and traveling. Who will ultimately rule the seas? Ride into adventure in a new version of the Wild West! Bandits and gunfights, in ghost towns and on locomotives. Intrigue and excitement abound in the prairie and the badlands, when the Nelsons face a gang of bandits who have a secret agenda. Who will be lauded as a hero and who will be branded a villain? ​Coming to Amazon and bookstores near you in Summer 2016!